I confess that I am a paranoid parent….I have three young children and between asthma, a broken leg and a campfire accident, I feel even more worried and overprotective than ever. I was intrigued by the book, “The Paranoid Parent’s Guide” by Christie Barnes and I was not disappointed. It was as if this book was written for me and at the very least it made me feel as though I am not alone in my fears. 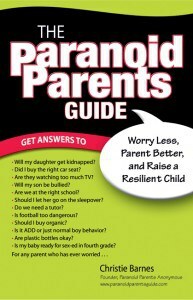 The Paranoid Parent’s Guide seeks to give parents a “reality check” about perceived vs. real threats to our children. For example, do you worry about kidnapping, shark attacks, school snipers, natural disasters or terrorism, just to name a few? If so, you are not alone according to the top 10 parental worries noted in this book. Fortunately, according to the author, “the odds of most of these catastrophes happening to a child are 1 in 10 million.” The real causes of death and injury to children include car accidents, homicide, fire (we recently experienced devastation related to this in our own family), bicycle accidents and unintentional poisoning. I have always felt that knowledge is power and the more information I have, the less anxious or “paranoid” I am about a particular situation. That is the beauty of this book. It gave me the tools and information that I need to assess the risk of certain situations so that I can try to relax and enjoy parenting without that constant sense of fear. A chapter of the book had a particularly interesting article for me about fear of sharks. Apparently children are “more likely to be injured by a shopping cart than a shark.” For me, I live in Florida and frequent the beach known as the shark bite capital of the world so unfortunately, I will remain fearful of sharks chomping off my children’s toes. However, there are many other topics covered in this book that have helped me to become more confident and less fearful. If you are a “paranoid parent” like me than I highly suggest purchasing this book.